16 LED Red/White Light Flashlight, Kosmos Scientific de México, S.A. de C.V. 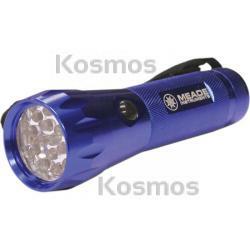 The LED flashlight features a very bright beam from 16 LED's and is push button selectable from white for normal illumination to red to preserve night vision. Heavy duty metal construction, with threaded battery compartment.